Chichester: knitted delights in charity shop window! The Chestnut Tree House shop in North Street, Chichester, has a unique window display with a choral flavour for Christmas. Spokeswoman Jane Binns said: “Local resident and Chestnut Tree House supporter, Rosie Turner, has kindly donated a group of choirboys and girls with their choirmaster, all beautifully hand knitted and they are currently singing in the shop’s window. 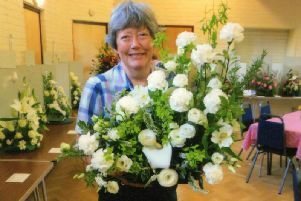 “Rosie, who is 85 and well known locally as the piano player for the Bosham Old Timers (BOTS), is the mother-in-law of local author Kate Mosse. Rosie has been knitting in aid of Chestnut Tree House for several years. “Kate was involved in the Festival of Chichester last summer, judging the local shop windows when the Chestnut Tree House charity shop in Chichester won first prize! Chestnut Tree House Shop Manager Helen Smith said, ‘We were delighted with the knitted choirboys and have been inundated with compliments. Within 10 minutes of them being displayed in the window, a customer generously offered a £25 donation and is happy to leave them in our window display until Christmas Eve for everyone to enjoy’. “The shop sells a variety of clothes and other items, many ideal as Christmas gifts, so come along to have a look at the window, do some Christmas shopping and help raise funds for local children with life-shortening conditions.